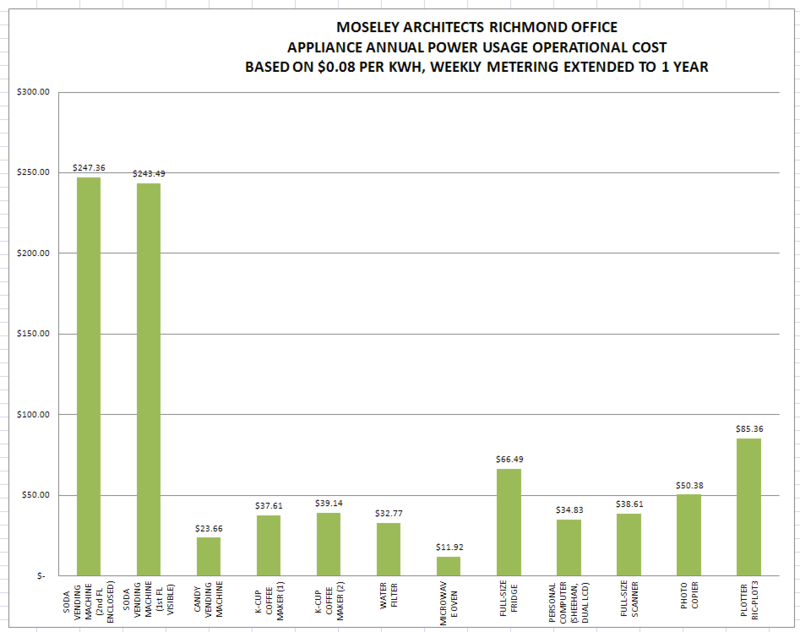 Have you ever wondered how much electricity our office electronics and appliances are using? No? Well you’re about to find out! In the interest of being concientious consumers, Seeds of Green volunteers used a portable meter to measure the electricity drawn by various items around the office. All this involved was plugging in the meter and leaving it in place for several days. This handy little meter is called a Kill-A-Watt–reasonably priced at Amazon if you want to try this experiment at home. The results are depicted below, and you can see which item is by far the office energy hog. Why do the drink machines use so much energy? The lights don’t appear to be a major draw, since the snack machines use similar lights but far less energy. Refrigeration to keep the drinks cold is the apparent reason, in conjunction with very poor insulation since they use almost four times the electricity of a full-sized refrigerator.